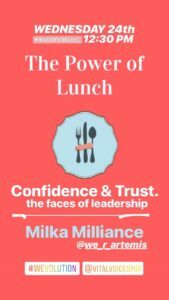 Confidence & Trust – The Faces of Leadership The most powerful theme in leadership development in 2018 is TRUST. The world over, there is a lack of trust, especially between individuals and institutions, the workplace being ground zero, especially among younger workers, particularly women. If female managers don’t believe that their efforts will be acknowledged and refrain from pursuing new opportunities – it indicates a low level of trust in the organization. To change this reality, their perception must be altered through what is seen and believed. Post hashtag#metoo, hashtag#TimesUpNow, hashtag#DrBlaseyFord and all the other hashtag#womensrights movements of the past 2 years – what have we learned, if anything, and what now? We had a wonderful time at Novocento Brickell having candid discussions about the three different dimensions of power – self, community and the institutions we interact with daily. CEO/Founder of We R Artemis Leadership. Badass women's leadership coach for women mindfully scaling up their corporate careers or starting their own companies. This Artemis Women's Leadership Blog is a platform that supports women to step into leadership to find their courage and self confidence to do power differently. We R Artemis Leadership Inc.